How do I load and view the maps? What are "Temporary Places" and "My Places"? How detailed are the maps? For help downloading and installing Google Earth, check it's home page, here. Assuming you've already downloaded and installed Google Earth, you should be able to simply double-click on any "KMZ" file to load it. If that doesn't work, you can launch Google Earth yourself and use the "File... Open..." menu to open the file. As soon as the file is opened, you should see an aerial view of the world with several red and green dots marked on the landscape. Those dots mark the locations of the transmitters in the area (red=analog channels, green=digital channels). By default, the coverage maps are not visible when the file is initially loaded. To see the available coverage maps, you'll need to click on the "+" sign next to "Tx maps On/Off". This will expand the folder containing a list of all the included coverage maps. The transmitters are listed with the digital ones first, followed by the analog ones. If you are looking for a specific transmitter, the maps are sorted alphabetically by their call sign. To view the coverage map for any of the transmitters, just click on the circle to the left of the transmitter's call sign. The map will begin loading, and within a few seconds, you should see the colored map appear on top of the terrain. At this point, you can use the 3D controls of Google Earth to fly around, tilt, zoom, and rotate your view to examine the coverage map any way you like. You can select a different coverage map at any time and see how well all the different stations are reaching your neighborhood. If you click on any of the transmitter icons, a balloon will pop up with a few vital stats about the transmitter plus a link to the FCC's transmitter web site. Google Earth always starts with two top-level folders. One is called "My Places" and the other is called "Temporary Places". Anything placed in "My Places" will be remembered and automatically loaded every time you start Google Earth. Anything in "Temporary Places" will be forgotten when Google Earth exits and will not be loaded the next time it is run. When you load KMZ files, they are initially placed under the "Temporary Places" folder. If you want these maps to be available every time you start Google Earth, then you should drag its folder out of "Temporary Places" and put it under "My Places". If you quit Google Earth with anything (even an empty folder) under "Temporary Places", it will pop up a warning and ask if you want to move those items to "My Places". You don't need to move the maps unless you want them to be available every time you start Google Earth. You can always load the maps again from the original KMZ file when you need them. 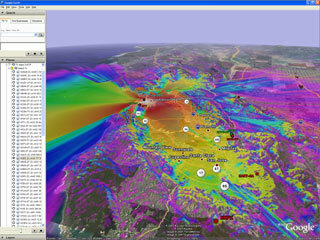 These maps are generated from simulations using the Longley-Rice Irregular Terrain Model. These modeling algorithms are based on the laws of physics and the way that radio waves propagate through the air and over the Earth. The composition of the terrain, the curvature of the Earth, the diffraction over mountains / hilltops, and the reflection off the troposphere are all considered when computing the expected signal strength at various points on the map. The transmitter information (including location, broadcast power, antenna height, and antenna pattern) comes directly from the FCC (http://www.fcc.gov/). Approximately 120 MB of data is extracted from the FCC database files for use here. The terrain data comes from the Shuttle Radar Topography Mission (SRTM). Information about this data set can be found at http://srtm.usgs.gov/. Approximately 9.1 GB of data (only counting North America) is extracted for use here. 1. Estimate the equivalent isotropically radiated power (EIRP) of the transmitter. Since many broadcasters use directional antennas, the amount of radiated power can vary depending on the direction. 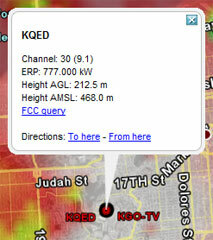 The EIRP is adjusted according to the direction and radiation pattern that the broadcaster has on file with the FCC. 2. Compute the terrain profile between the transmitter and receive points. This involves extracting and interpolating terrain elevation data for many points along the path between the transmitter and receiver. Higher resolution (smaller steps) in the terrain data usually generates more accurate propagation estimates since more detail is captured, but this also increases the total number of computations required. 3. Compute the Longley-Rice propagation loss for the given input data. Transmitter height, signal frequency, terrain profile, receiver height, Earth curvature, terrain type, and other parameters are taken into account within the model. This is a computationally intensive step due to the large number of bins in the terrain profile that need to be processed. 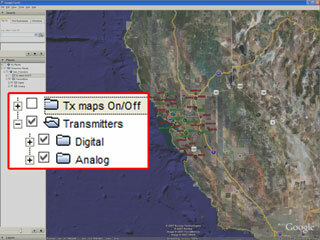 A coverage map for a transmitter consists of an image that is "draped" on top of the terrain in Google Earth. To create the coverage map for a single transmitter, the above steps need to be repeated for every pixel in the overlay image. In other words, a virtual receiver is placed at every pixel in the image and simulated (still taking into account transmitter antenna pattern effects). In order to achieve a target of 350 meters resolution in the final map, the images need to be approximately 1500x1500 pixels, so the simulation steps need to be repeated about 2 million times to fill in one map. Each metro package contains several transmitter maps, so it's safe to say that each package represents the result of many trillions of calculations and many hours of computer processing. The maps are processed with approximately 1000 foot resolution. This should be enough resolution to see general trends at a neighborhood level, but it's not good enough draw any conclusions about a specific address. For an address-specific analysis, it is highly recommended that you try the TV Signal Locater. That tool will analyze a specific point (including height) at the full resolution supported by the underlying databases and should provide a much more accurate estimate of the TV signal levels. 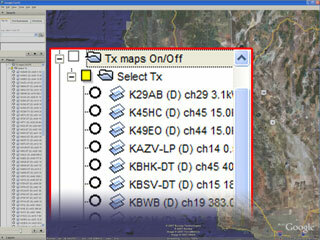 The terrain and transmitter databases support the generation of more detailed coverage maps, but the computational load to generate high resolution maps would be excessive (weeks to months per set!). The current level of detail was chosen to make sure the maps could be released in a reasonable amount of time and still be very useful at the "macro" scale.